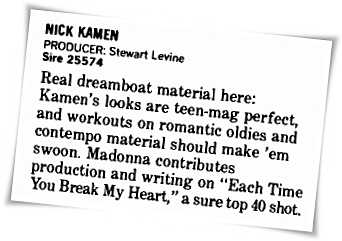 On May 9 1987, Nick Kamen’s self-titled debut album – featuring the Madonna/Steve Bray written & produced track, Each Time You Break My Heart – was reviewed in Billboard. 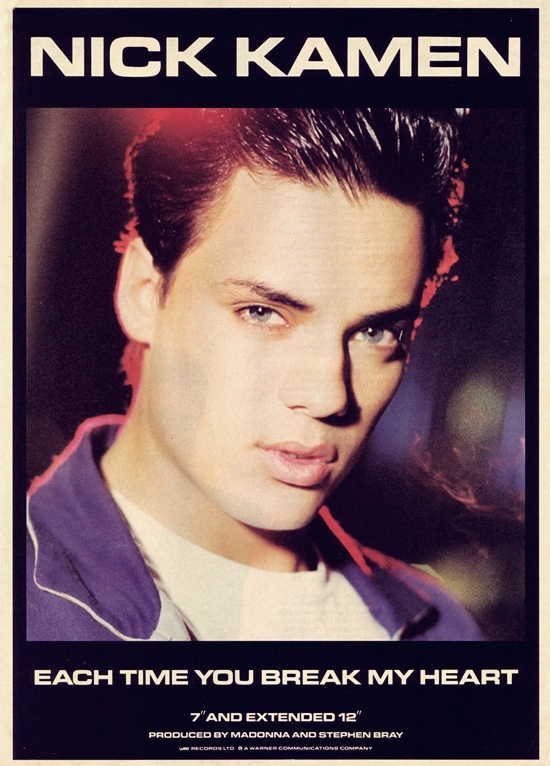 The video for the single had other Madonna connections, as it was directed by Jean-Baptiste Mondino and featured her Open Your Heart video co-star, Felix Howard, while the U.S. maxi-single was remixed by future Madonna collaborator, Shep Pettibone. Each Time You Break My Heart was originally demoed during the sessions for Madonna’s True Blue album but sadly did not make the final cut. Kamen’s version featured the same musicians and backing vocalists (including Siedah Garrett & Edie Lehmann) from those sessions. A low-quality recording of Madonna’s original demo leaked to the internet in the early 2000’s. Madonna fans would certainly welcome a deluxe edition of the True Blue album featuring Madonna’s version of this excellent cut and other outtakes of the era! The ending “Break my heart, don’t break my heart…” sounds like the ending to “Waiting” on Erotica! Yes, you’re absolutely right! The first time I heard the song was about a year or two after the Erotica album was released, and I remember noticing this similarity as well! Interestingly, the demo version that leaked containing Madonna’s full vocal does not include that part, instead focusing on the “you were mine” part towards the fade-out. 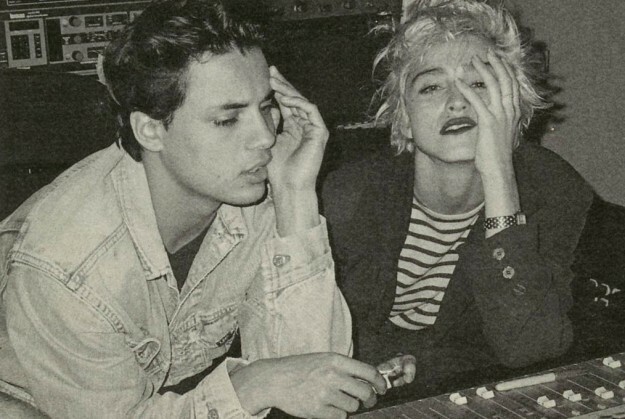 However, it is quite likely that the leaked version is an early demo and that another studio version identical to Kamen’s but with Madonna on lead vocals also exists but hasn’t leaked…the fact that the musicians and backing vocalists all match those used during the True Blue album sessions would suggest that Kamen simply laid down his vocals on a preexisting production of the track that originated during the TB sessions. They sure would be nice to have! It seems like Madonna is the only artist left on the planet who has done virtually nothing to honor their catalogue of music with a proper reissue program. It’s really a shame and makes little sense, especially considering she’s one of the most successful music artists of all time! Fans have been begging for this forever, and there are more than enough of us to make it well worth the investment. Warner would certainly jump at the opportunity to do a proper reissue program for her, but they can’t do it without Madonna’s approval. As long as the reissues are given the love and attention they deserve, it’s a win-win for everyone…the fans, the label, Madonna, even Guy O. Most fans I know are not interested in shelling out big bucks for pricey gym memberships or skin care products. But every fan I know has this in common: we love her music. While we’re glad that she’s a forward thinking artist, it’s more than puzzling to think that she’d rather invest her time trying to get people to buy products that have no artistic merit than it would be for her to – god forbid – take another listen through her amazing body of recorded work. I fail to understand how the former could possibly be more gratifying for her on any level…artistically, spiritually, intellectually – hell, even financially…than the latter. Looking back does not negate moving forward. On the contrary…giving some much needed love to her back-catalogue would actually bring renewed interest to her current and future work. And it would make us fans so happy to pay for deluxe editions that pair her classic albums with unreleased songs, demos, remixes and music videos. And if she just can’t bring herself to get involved, I’m sure any of the fantastic co-producers that were involved with these albums would be thrilled to take the reigns. There’s really no good reason not to do it.